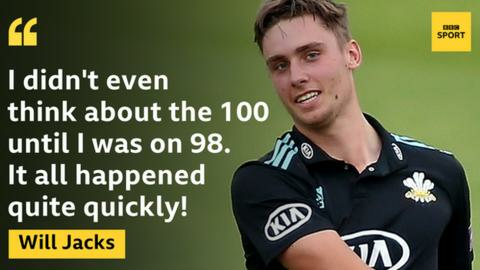 Surrey opener Will Jacks blasted a century off just 25 balls, including six sixes in an over, in a pre-season 10-over game against Lancashire. It is thought to be the fastest hundred in a match with two professional sides, but will not be officially recorded. The 20-year-old smashed Lancashire's Stephen Parry for six straight maximums in Dubai, in an over that went for 37. Jacks finished on 105 off 30 deliveries after hitting 11 sixes and eight fours in Surrey's winning total of 176-3. He is the first player to make a hundred in a T10 game, surpassing the 87 made by Alex Hales in December. Ten-over cricket has grown in popularity over the past couple of seasons, with players including England's Hales, Eoin Morgan and Jonny Bairstow featuring in the T10 League over the winter. While Jacks' innings will not go into the official record books, it still came against a Lancashire side containing several first-team regulars, including Steven Croft, Parry, Tom Bailey and Haseeb Hameed. Glen Chapple and Mark Pettini both made hundreds in 27 balls in county cricket, but the bowlers were deliberately bowling full tosses to set up a declaration. West Indies great Chris Gayle holds the fastest recorded century, against non-declaration bowling, off 30 balls while playing for Royal Challengers Bangalore in the 2013 Indian Premier League. South Africa's AB de Villiers scored the quickest hundred in international cricket - making a 31-ball century against the West Indies in a one-day game in 2015. Surrey are currently in the United Arab Emirates in preparation for their Champion County match against the MCC which starts on Sunday.